(Türkçe) Birgün: Yeni Hasankeyf’te bekâra yer yok! Sorry, this entry is only available in Türkçe. This entry was posted in Media Articles. Today the Initiative to Keep Hasankeyf Alive has sent a catalogue of questions to the candidates of the four big political parties in five provinces (Batman, Siirt, Diyarbakir, Mardin and Sirnak) which would be affected by the destructive Ilisu Dam. The candidates have been requested to answer until the 2nd of June. This entry was posted in Press Releases. Here is a picture from Hasankeyf shooten on the 25th of April 2015. It shows the city from the hill above, in the background is “New-Hasankeyf” where the public buildings have been built already. 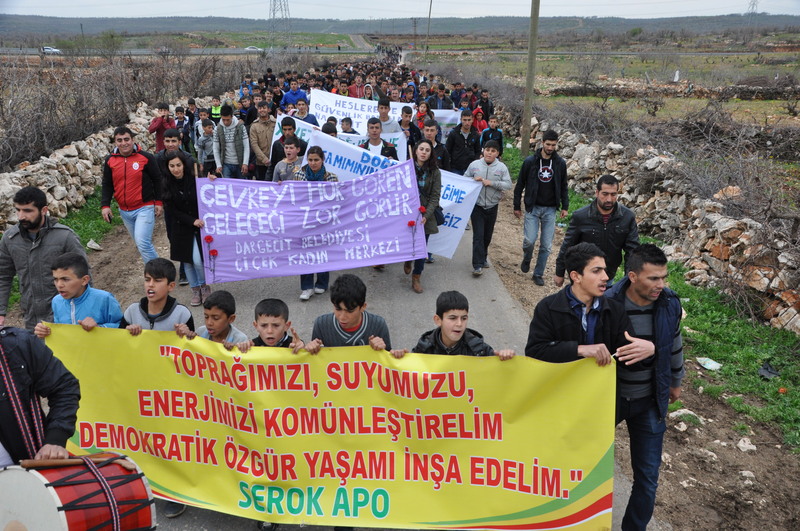 A protest action against the Ilisu Dam in the town of Dargecit (Kerboran) is confronted with repression. 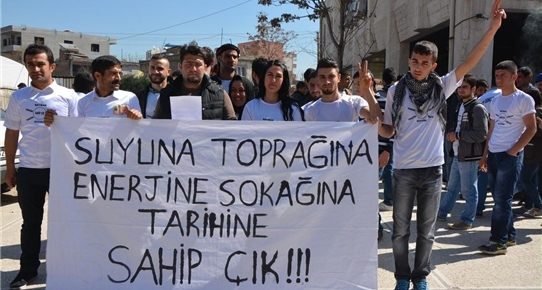 The youth of DBP (Democratic Regions Party) has started this protest on the 13th of April 2015 in order to raise attention against the ongoing construction of the Ilisu Dam. This entry was posted in Press Releases, Uncategorized. Ilisu Dam protest close to the dam site! Today more than 500 people have protested the destructive Ilisu Dam project in the town of Dargecit. The demonstrators aimed at protesting at the dam site, but were prevented by the police. We will organize a protest action at the Ilisu Dam Site on the 29th of March. Everybody is invited to join us in order to protest the destructive Ilisu Dam Project. A group of DBP youth marched from Batman to Hasankeyf in order to protest the Ilisu Dam and for the rescuing of Hasankeyf. The march started in front of the municipality of Batman. The protestors argued that their aim is to defend the water, land, energy and culture of the region against profit and repression. This entry was posted in Media Articles, Uncategorized. We call everybody to join our march to the Ilisu dam construction site on the 28th of March. This call is to everybody who wants to protest the Ilisu dam which would have grave social, ecological and cultural impacts on dozen of thousands of people in the flood area and millions of people in Iraq.